Here is the list of the hotels near Avrechy. Book your hotel near Avrechy today, Thursday 16 May for the best price, reservation and cancellation free of charge thanks to our partner Booking.com, leader in on-line hotels reservation. Below here is the list the 50 closest hotels of Avrechy, sortable according your criteria. You will find the position of these accommodations on the Avrechy hotels map. Bed and Breakfast Fournival Preferred hotel ! Offering garden views, Les Clefs de L Argilière in Fournival features accommodation, free bikes, a seasonal outdoor swimming pool, a garden and a terrace. Complimentary WiFi is offered. Fitted with a patio, the units feature a flat-screen TV and a private bathroom with free toiletries. A microwave and toaster are also available, as well as a coffee machine. A continental breakfast is served daily at the property. Guests can grab a bite to eat in the in-house restaurant, which serves French cuisine. The property has a hot tub. Cycling can be enjoyed nearby and a bicycle rental service is available. Beauvais is 27 km from the bed and breakfast. The nearest airport is Paris Beauvais-Tille Airport, 28 km from Les Clefs de L Argiliere. Located a 25-minute drive from Beauvais Airport, a 30-minute drive from the Asterix Park and a 15-minute drive from Creil and Nogent-sur-Oise, Hotel Akena offers a warm and friendly welcome in a functional setting. The hotel features 44 comfortable rooms including 2 for mobility impaired guests. Each room features free Wifi access, Canal+ and international beIN Sports channels. In the morning, get off to a great start with the all-you-can-eat buffet breakfast. Hotel Akena boasts a functional situation between Creil, Beauvais and Compiègne and offers easy access to the road network of the region. In the heart of the Oise region, in the land of cathedrals and castles, the hotel Clermotel is situated in a rural setting, in the edge of the forest of Hez-Froidmont. All on the ground floor, the rooms are giving on the flowered gardens, each one with private bathroom and small individual terrace. The Clermotel has meeting rooms well equipped and a restaurant "L’Oiselet" which suggests local cuisine. Many activities are offered in the park such as tennis, pétanque, volley-ball and various indoor games like ping-pong, table football and computer games. Located in the centre of the historic town of Clermont, Les Hortensias offers a small fitness room with exercise bike, a garden and terrace. It is along the Saint James’s Way, 57 metres from the town hall and only a 35-minute train journey from Paris. The room features a view of the town and garden, a sofa and a wardrobe. The en suite bathroom includes free toiletries and a hairdryer. A breakfast is available each morning at Les Hortensias. Guests can also enjoy homemade cuisine, prepared by the host, upon request. Other facilities offered include a shared lounge, a games room and a children's playground. The Chantilly, Senlis and Compiègne Forests are a 20-minute drive away and Beauvais Airport is 23.6 km from the property. The Clermont-de-l'Oise Train Station is 650 metres away. Bed and Breakfast Nointel Preferred hotel ! Maison d'hôtes Chez Lila des bois is offering accommodation in Nointel. The property has a seasonal outdoor swimming pool, as well as a garden. Guests can enjoy the outdoor hot tub at an extra cost. The rooms in Maison d'hôtes Chez Lila des bois are fitted with a kettle. Rooms are complete with a private bathroom equipped with free toiletries, while selected rooms will provide you with a seating area. The units will provide guests with a fridge. Maison d'hôtes Chez Lila des bois offers a terrace. Villepinte is 46 km from Maison d'hôtes Chez Lila des bois, while Roissy-en-France is 42 km from the property. Paris Beauvais-Tille Airport is 28 km away. Featuring accommodation with a terrace, les glycines is set in Cressonsacq. Complimentary WiFi is available. The holiday home features 2 bedrooms, a kitchen with an oven and a microwave, and 1 bathroom with a shower and a hair dryer. A flat-screen TV is offered. The holiday home offers a barbecue. Guests can relax in the garden at the property. Beauvais is 43 km from les glycines, while Compiègne is 25 km away. Paris Beauvais-Tille Airport is 44 km from the property. Situated in Cressonsacq, 34 km from Beauvais, Paisible ( Parenthèse ) boasts an outdoor pool and seasonal outdoor pool. Free private parking is available on site. The rooms are fitted with a flat-screen TV. Some rooms feature views of the pool or garden. Paisible ( Parenthèse ) features free WiFi throughout the property. Evening meal prepared by the host can be served. Reservations for dinner can be made at the time of booking. You can play table tennis at the bed and breakfast. Compiègne is 20 km from Paisible ( Parenthèse ), while Chantilly is 30 km from the property. The nearest airport is Paris Beauvais-Tille Airport, 33 km from Paisible ( Parenthèse ). Au Refuge Des 3 Ours - Chambres d'hôtes is a converted farmhouse, surrounded by an arboretum with over 400 trees and shrubs. This B&B offers en suite rooms and free Wi-Fi is available and Beauvais city centre is a 25-minute drive away. The rooms at Le Refuge Des 3 Ours are situated in a building annex made of ecological materials. Upon request, Le Refuge Des 3 Ours serves traditional French cuisine made from local ingredients. Guests can dine in the dining room or on the terrace during nice weather. Le Refuge Des 3 Ours is a 20-minute drive from Beauvais Airport and 80 km from Paris. It is accessible from the A16 motorway. Guests have access to free public parking nearby and the on-site spa at an additional cost. Chambre d'Hôtes La Demi-Lune is set in a 5000m² garden surrounded by woodlands, a 30-minute drive from both Beauvais and Compiègne. It offers a communal room with a microwave and fridge at guests’ disposal. Rooms are individually decorated in warm colours and some are attic rooms. Guests have access to a shared bathroom. A continental breakfast is served daily. You will find shops and restaurants in Liancourt, 5km away. You can enjoy hiking and cycling along the trails in the area. Chambre d'Hôtes La Demi-Lune also provides free private parking. Situated in Hondainville, 25 km from Beauvais, Camping du Château Vert offers a children’s playground, pétanque facilities and free private parking. Free Wi-Fi is provided in the entire property. The property features self-catering mobile home and chalets with a fully equipped kitchen, a seating area with a TV and a shower room. They also have an outdoor, furnished terrace where you can enjoy your meals. Camping du Château Vert provides a tennis table, BBQ facilities and a laundry wity washing machines and clothes dryers. Camping du Château Vert is 3 km from some restaurants, shops, a horse riding centre and a swimming pool. Bailleulg sur Thérin Castle is 8km away and Paris city centre is 60 km away. Located in Angy, Clairefontaine Chambre d'Hôtes offers a garden and terrace. The air-conditioned rooms provide a garden view and come with a wardrobe and free WiFi. All rooms in the guest house are fitted with a flat-screen TV. Rooms are complete with a private bathroom equipped with a bath and free toiletries, while certain rooms are equipped with a balcony. A continental breakfast is served daily at the property. Beauvais is 25 km from Clairefontaine Chambre d'Hôtes. The nearest airport is Paris Beauvais-Tille Airport, 26 km from the accommodation. Located 5 km from the Eze Park and 17 km from Beauvais Airport, Villa Les Iris sits in a 5000-m² park. It offers a garden with a table and chairs, free Wi-Fi, and free private parking. With a view of the garden, the rooms at Villa Les Iris feature a flat-screen TV with cable channels, a welcome tray, an electric kettle and ironing facilities. The private bathrooms include a bath tub and toilet. A full English breakfast is served daily and you can also share meals with other guests and sample traditional French and Italian cuisine, if requested in advance. Villa Les Iris is 30 km from Chantilly, 50 km from CDG International Airport, and Chamblis Train Station is 20 km from the property. Situated in Estrées-Saint-Denis, Le Cèdre - B&B offers accommodation with a flat-screen TV. Complimentary WiFi is provided. The units have a fully equipped kitchenette with a microwave and a fridge. There is a private bathroom with shower and free toiletries in each unit, along with a hair dryer. The daily breakfast offers continental and gluten-free options. There is an in-house restaurant, which specialises in French cuisine. The bed and breakfast offers a terrace. Guests can also relax in the garden or on the shared lounge area. Beauvais is 46 km from Le Cèdre - B&B. The nearest airport is Paris Beauvais-Tille Airport, 47 km from the accommodation. Le Sous-bois B&B is 19 km from the centre of Compiègne, just a 12-minute drive from the A1 motorway. This property offers a covered swimming pool, free WiFi and a guest room with a balcony. The room features garden views, a desk and a private bathroom with a hairdryer, free toiletries and a shower. Bathrobes are provided. Guests are invited to enjoy a daily breakfast at Le Sous-bois B&B. They also have access to a shared lounge. This property has a garden and free parking is provided. Paris-Charles de Gaulle Airport is 54 km away. Chateau de Bury is located in Bury and offers a seasonal outdoor swimming pool and a tennis court. Guests have a private terrace. Opening onto a balcony with garden views, the holiday home consists of 1 bedroom. A flat-screen TV with satellite channels is featured. The holiday home offers a barbecue. Beauvais is 27 km from Chateau de Bury, while Compiègne is 47 km away. Paris Beauvais-Tille Airport is 28 km from the property. Guest accommodation Villers-Saint-Sépulcre Preferred hotel ! Located in Villers-Saint-Sépulcre, Relais Alex offers homestay accommodation just a 20-minute drive from Beauvais-Tille Airport. Guests have access to a shared lounge, garden and terrace. Free toiletries are also provided in the room. The bathroom and toilet facilities are shared. A breakfast is provided each morning at Relais Alex. Guests can also enjoy a homemade meal upon request. Additional features include free WiFi access throughout and free private parking on site. Compiègne is a 50-minute drive away and the Château de Chantilly is 46 km from the property. A shuttle service to the airport or train station can be organised by the hosts. L'Escale is situated in Velennes. The accommodation features free WiFi. The apartment comes with a flat-screen TV. Beauvais is 11 km from the apartment, while Chantilly is 48 km away. The nearest airport is Paris Beauvais-Tille Airport, 9 km from the property. The ibis Creil Sur Oise welcomes you to the heart of this historic region. Discover the charm and comfort of this exceptional hotel. Free Wi-Fi access is provided throughout the hotel. Each of the guest rooms is fitted with a radio and a TV with Canal + channels. The en suite bathrooms include a hairdryer. A buffet breakfast composed of sweet and savoury dishes such as eggs, fruit salad, yogurts and juices is served every day. Pastries baked on site and fresh French Madeleine cakes are also on offer, as well as a hot beverage and a piece of fruit to take away. Outside of regular breakfast hours guests can also enjoy a lighter option, available from 04:00. Set in Montreuil-sur-Thérain in the Picardy region, Tez' Hotes features a terrace. This property offers access to ping-pong and free WiFi. The bed and breakfast comes with a flat-screen TV. A continental breakfast is served every morning at the property. The bed and breakfast offers a barbecue. Guests can relax in the garden at the property. Beauvais is 11 km from Tez' Hotes, while Chantilly is 41 km from the property. Paris Beauvais-Tille Airport is 17 km away. You will find our hotel ideally located near a large public park. By staying in our hotel, you will discover the historical cities of Senlis, Chantilly and Compiègne. You can enjoy yourselves in the leisure parks of Asterix, La Mer des Sables, the Park St. Paul and of course, Disneyland Resort Paris. Breakfast buffet - Help yourself to as much as you want. Dinner and lunch is served at the Campanile, located in the same area, offering French cooking and nice buffets. Set on the banks of the River Oise, this low-cost hotel is just 100 metres from the town centre of Villiers Saint Paul and a 5-minute drive from Creil Train Station. It has a 24-hour reception and a garden with a terrace. Each guest room is equipped with a TV, free Wi-Fi access and a telephone. All of the rooms have a private bathroom including amenities. Traditional French cuisine is served in the restaurant at hotel Campanile Creil. Free private parking is available on site and Creil Train Station is 1.5 km away. Asterix Theme Park is a 30-minute drive away. Le Grenier is situated in Les Ageux. This property offers access to a terrace. The country house includes a kitchenette with a microwave and a toaster, as well as a coffee machine. The reception can provide advice on the area in order to help guests plan their day. If you would like to discover the area, cycling is possible in the surroundings. Villepinte is 46 km from the country house, while Roissy-en-France is 40 km away. Paris - Charles de Gaulle Airport is 41 km from the property. Featuring a garden, La Maisonnette provides accommodation in Les Ageux with free WiFi and garden views. Guests staying at this holiday home have access to a fully equipped kitchen and a terrace. The holiday home includes 2 bedrooms and a living room with a flat-screen TV and a DVD player. The property also has 2 bathrooms has a shower. Staff at the 24-hour front desk can help guests with any queries that they may have. If you would like to discover the area, hiking is possible in the surroundings. Villepinte is 46 km from the holiday home, while Roissy-en-France is 40 km from the property. The nearest airport is Paris - Charles de Gaulle Airport, 41 km from La Maisonnette. Featuring free bikes, La Ferme Oasis provides accommodation in Belloy. Free WiFi is featured. The bed and breakfast provides guests with a terrace, garden views, a seating area, satellite flat-screen TV, a fully equipped kitchenette with an oven, and a private bathroom with hot tub. A microwave and fridge are also available, as well as a coffee machine and a kettle. La Ferme Oasis offers a barbecue. Guests can go cycling or relax in the garden. Compiègne is 23 km from the accommodation, while Senlis is 49 km away. Paris Beauvais-Tille Airport is 50 km from the property. Apartment Les Ageux Preferred hotel ! Located 40 km from Villepinte, Le Presbytère offers accommodation in Les Ageux. The property boasts views of the garden and is 24 km from Astérix Park. Free WiFi is offered. This apartment features a fully equipped kitchen, a sofa and a private bathroom fitted with a walk-in shower. Bike hire is available. You can engage in various activities, such as horse riding, golf, fishing and hiking. Senlis is 14 km from the property while Chantilly is 23 km away. Paris - Charles de Gaulle Airport is 34 km away. A traditional country house set in a well-kept garden, Chez Francine et Xavier offers a terrace and Wi-Fi is free of charge in the entire property. The B&B is 15 km from Beauvais Airport. With a view of the garden, the rooms at Chez Francine et Xavier feature wooden floors, a wardrobe and an electric kettle. The private bathrooms are complete with a bath tub or shower, toilet and hairdryer. A homemade continental breakfast is served daily and you can also share meals with other guests and sample regional specialities. Chez Francine et Xavier is 5 km from the A16 motorway and there is an amusement park in Saint Paul, which is 27 km from the property. Free private parking is provided on site. Featuring a garden and free WiFi, Auberge De Daniel is situated in Mello. Boasting a shared lounge, this property also provides guests with a terrace. The property has a restaurant. At the hotel, the rooms are fitted with a desk and a flat-screen TV. The rooms come with a private bathroom with free toiletries. All guest rooms include a wardrobe. A continental or buffet breakfast can be enjoyed at the property. Roissy-en-France is 49 km from Auberge De Daniel, while Beauvais is 33 km away. The nearest airport is Paris Beauvais-Tille Airport, 34 km from the accommodation. Located in Cires-lès-Mello in the Picardy region, Holiday Home Cires Lès Mello with Fireplace I is a 4-star property featuring free WiFi. Guests staying at this holiday home have access to a fully equipped kitchen. The property includes a living room with a TV. Roissy-en-France is 49 km from the holiday home, while Beauvais is 32 km from the property. Paris Beauvais-Tille Airport is 34 km away. Offering free WiFi and city views, maison de village is an accommodation set in Le Mesnil-Saint-Firmin. Guests staying at this apartment have access to a fully equipped kitchen. The apartment is equipped with a flat-screen TV and a living room. If you would like to discover the area, hiking is possible in the surroundings. Amiens is 41 km from the apartment, while Beauvais is 43 km from the property. The nearest airport is Paris Beauvais-Tille Airport, 35 km from maison de village. Gite les Merlettes is a holiday home located in the hamlet of Mattencourt, 2 km from Abbecourt. It offers a garden with outdoor furniture and free Wi-Fi access is available throughout. Beauvais is 11 km away. Set on 2 floors, the accommodation features 2 bedrooms with wooden furniture, a living room with flat-screen TV, fireplace and DVD player, as well as a garden view. The private bathroom is fitted with a bathtub and hairdryer. You can prepare meals using the accommodation’s kitchen, which is equipped with dishwasher, a microwave and a spacious dining area. Shops can be found 6 km from the property. The property offers free private parking and Beauvais Airport is 12 km away. Chantilly is 35 km from the accommodation. Floroise is located in Pont-Sainte-Maxence. The property features garden views and is 49 km from Villepinte. The train station is 550 metres away, which provides direct access to Paris Gare du Nord Train Station in 40 minutes. This apartment has a living room and a fully equipped kitchenette. Bed linen and towels are provided. Roissy-en-France is 38 km from the apartment, while Beauvais is 49 km from the property. The nearest airport is Paris - Charles de Gaulle Airport, 41 km from Floroise. L’Echappée Belle is set in an 18th-century farm located in Cauvigny, 16 km from Beauvais and 22 km from Chantilly. It features individually decorated rooms, free Wi-Fi access and a landscape garden with a pond. Each room has a garden view and includes a flat-screen TV, a seating area and a private bathroom with a shower, hairdryer and free toiletries. Breakfast is served daily and includes homemade cake and jam. Guests can relax in the swimming pool or the hot tub, accessible at an extra charge. Bicycle rental is available at L’Echappée Belle and free private parking is possible on site. The property is just a 1-hour drive from Paris. An 18th century castle featuring gardens and terraces, Top' Meublés Locations offers self-catering apartments with free Wi-Fi access in the centre of Pont-Sainte-Maxence. A 30-minute drive from Roissy-Charles de Gaulle International Airport, it is serviced by the A1 motorway. Featuring antique-style furnishings and wooden floorboards, the en suite apartments offer views of the park, the gardens or River Oise. They include a seating/dining area with flat-screen TV and a washing machine. The kitchen features an oven, fridge, kettle and coffee machine. Local pubs and restaurants are in the immediate vicinity and can be easily reached on foot. A 30-minute drive from the famous châteaux of Chantilly, Compiègne and Pierrefonds, Top' Meublés Locations offers free, private parking on site. Paris-Nord Villepinte Exhibition & Convention Centre is 20 km away. Car rental is possible on site. Guest accommodation Creil Preferred hotel ! Chambres meublées chez l'habitant dans appartement proche gare sncf offers pet-friendly accommodation in Creil. Free private parking is available and the host will provide you with a code to access free WiFi. All rooms have access to a shared bathroom. They also include a seating area. You will find a shared kitchen with a kettle at the property. Paris is 46 km from Chambres meublées chez l'habitant dans appartement proche gare sncf, while Villepinte is 34 km away. Paris - Charles de Gaulle Airport is 29 km from the homestay. This former farmhouse now functions as a 2-star hotel, just 10 km from Chantilly Chateau and Senlis. You can dine in the on-site restaurant or go to Paris from Creil RER Train Station, a 10-minute drive away. The rooms at Hotel Restaurant - La Ferme de Vaux are contemporary in style and offer an LCD TV with satellite channels. All rooms have free Wi-Fi access and also include free toiletries in the en suite bathroom. The hotel serves a buffet every morning in the breakfast room. You can also sample one of the set menus, which feature specialties such as homemade foie gras and smoked salmon. Free private parking is available on site and local activities include hiking and cycling. Chateau de Chantilly is another nearby attraction, 9.5 km away, and Halatte Forest is a 5-minute drive away. Le Chouette Logis is located in Verneuil-en-Halatte. The property features garden views. Providing access to a terrace, the holiday home consists of a fully equipped kitchen and a flat-screen TV. The holiday home offers a barbecue. Guests can also relax in the garden. Villepinte is 46 km from Le Chouette Logis, while Roissy-en-France is 40 km from the property. The nearest airport is Paris - Charles de Gaulle Airport, 41 km from the property. Located in Tillé and 4 km from Beauvais Airport, Aux 5 Sens is an 18th-century farmhouse offering private parking and WiFi. The rooms at Aux 5 Sens are decorated in a contemporary style and some rooms include a terrace. Each one has a large double bed, a TV, a Nespresso coffee machine and a private bathroom with Omnisens Paris toiletries, a hairdryer and bathrobes. Yoghurts, ham, cheese and drinks are also available at breakfast in the morning. Evening meals are available for an extra charge, if reserved 48 hours in advance. Upon reservation and for an extra charge, guests benefit from access to the wellness area which features a dry and humid sauna, a 5-seater hot tub, beauty treatments and massages. Herbal teas are also offered. There is also a meeting room in the renovated cellar. Local restaurants can be found in the town of Beauvais, 8 km from the property. Le Jardinet is situated in Pont-Sainte-Maxence and offers barbecue facilities and a garden. Guests staying at this apartment have access to a fully equipped kitchen. The apartment includes 2 bedrooms, a living room, and 1 bathroom with free toiletries. A flat-screen TV is provided. The apartment offers a sun terrace. Villepinte is 43 km from Le Jardinet, while Roissy-en-France is 38 km from the property. The nearest airport is Paris - Charles de Gaulle Airport, 39 km from the property. LE PIC'ARDIE is set in Pont-Sainte-Maxence and offers a garden. Guests staying at this apartment have access to a fully equipped kitchen. The apartment consists of 2 separate bedrooms, 1 bathroom with free toiletries and a hair dryer, and a seating area. A flat-screen TV is offered. The apartment offers a sun terrace. Villepinte is 43 km from LE PIC'ARDIE. Paris - Charles de Gaulle Airport is 39 km away. Located in Beauvais in the Picardy region, Holiday Home Beauvais Grande Rue De Villers is a 5-star property boasting free WiFi. The accommodation is 6 km from the The Oise Departmental Museum. The holiday home features a TV and a living room. Elispace is 6 km from the holiday home, while The National Tapestry Gallery of Beauvais is 5 km from the property. The nearest airport is Paris Beauvais-Tille Airport, 8 km from the property. 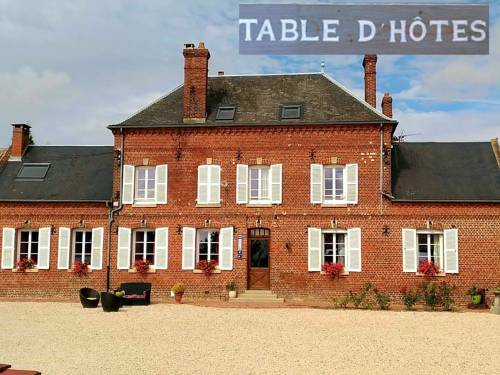 Located in Chevrières, Chateau le Quesnoy features accommodation with free WiFi. There is a private bathroom with bath and free toiletries in each unit, along with a hair dryer. A continental or buffet breakfast is available every morning at the property. The bed and breakfast offers a children's playground. This property provides a terrace. Roissy-en-France is 46 km from Chateau le Quesnoy, while Compiègne is 17 km from the property. The nearest airport is Paris - Charles de Gaulle Airport, 47 km from the accommodation. Hotel Beauvais Preferred hotel ! Set 4 km from Beauvais Cathedral, the Citôtel Hostellerie Saint Vincent is located just 5 minutes from Paris Beauvais Airport and has direct access to the A16 motorway. It offers free on-site parking and free Wi-Fi. Guest rooms at the Citôtel Hostellerie Saint Vincent include en suite facilities, satellite TV and a work desk. Some rooms offer a hydrotherapy bath. The restaurant serves traditional French cuisine. The bar is a good place to relax after a day of work, sightseeing or travel. For your convenience, reception is open 24 hours a day. The Citôtel Hostellerie Saint Vincent is situated only 30 minutes away from the centre of Paris and is close to the Channel and Normandy coasts. Charging stations for electric vehicle are available on site. Located 10 km from Château de Compiègne and set in an old farm built in the 18th century, Chambres d’hôtes – La rose des champs offers a large garden and a terrace. The elegant rooms are uniquely decorated with stone walls and antique furniture. They include a flat-screen TV and free Wi-Fi access is provided. A continental breakfast is provided every morning. Guests also have access to an equipped kitchen and to the barbecue facilities. Restaurants can be found within 10 km. Free bikes are at your disposal. Château de Pierrefonds is situated 20 km from the property. There is a free, private car park on site. Featuring free WiFi, a spa centre and a sun terrace, Au 2 Maison d'Hôtes offers accommodation in Muidorge, 42 km from Amiens. Guests can enjoy the on-site restaurant. Some units have a seating area where you can relax. All rooms feature a kettle and a private bathroom equipped with a bath or shower. For your comfort, you will find bathrobes, slippers and free toiletries. There is a shared kitchen at the property. You can engage in various activities, such as cycling and hiking. The bed and breakfast also offers free use of bicycles. Beauvais is 11 km from Au 2 Maison d'Hôtes, while Chantilly is 44 km from the property. The nearest airport is Paris Beauvais-Tille Airport, 8 km from Au 2 Maison d'Hôtes. Set in Beauvais, Fl Arago offers self-catering accommodation with free WiFi. The apartment is located in Ther Commercial Zone and is 3.5 km from The Oise Departmental Museum. Free private parking is available on site. The kitchen comes with a dishwasher. Towels and bed linen are available at Fl Arago. Elispace is 3.8 km from Fl Arago, while Beauvais Hospital is 5 km from the property. Paris Beauvais-Tille Airport is 5 km away. Located in Tillé, just 800 metres from Beauvais-Tillé Airport, Au Nid de Tillé offers B&B accommodation sitting in a garden with free Wi-Fi available throughout. Guests have access to a common living room with sofa and fireplace. All the guest rooms are modern and bright and have parquet floor and a TV with DVD player. Some have their own private bathroom with shower, while others offer access to a shared bathroom with shower. Every morning, guests can enjoy a continental breakfast served in the common room. From 18:00 to 23:00, light evening meals can be served upon request and at an extra charge. Restaurants and supermarkets are to be found in the area. Guests can drive 5 km to Beauvais city centre. There is access to A16 Motorway just 4 km away. B&B Hôtel Creil Chantilly offers free WiFi and rooms with air conditioning in Creil. All rooms feature a flat-screen TV with cable channels and a private bathroom. At the hotel, every room is equipped with a desk. The units have a wardrobe. Guests at B&B Hôtel Creil Chantilly can enjoy a buffet breakfast. Villepinte is 47 km from the accommodation, while Roissy-en-France is 41 km from the property. The nearest airport is Paris - Charles de Gaulle Airport, 42 km from B&B Hôtel Creil Chantilly. Bed and Breakfast Beauvais Preferred hotel ! Clos d'Allonne is located in Allonne, 3.9 km from The Oise Departmental Museum and 5 km from Elispace. Free WiFi is available and free private parking is available on site. Rooms include a flat-screen TV. Each room comes with a private bathroom. Beauvais Hospital is 6 km from Clos d'Allonne, while The National Tapestry Gallery of Beauvais is 3.7 km away. Paris Beauvais-Tille Airport is 6 km from the property. This hotel is located just a 10-minute drive from Beauvais-Tille Airport and 4 km from Beauvais city centre. It offers secure and free parking, and free Wi-Fi access. The guest rooms at the Hôtel balladins Beauvais are equipped with satellite TV and have private bathrooms. Guests can enjoy a buffet breakfast every morning. The balladins Beauvais has an on-site family-style restaurant, which serves traditional French cuisine. Guests can also enjoy an evening drink in the hotel’s private bar. Below here is the hotels map of Avrechy. Names and details of Avrechy hotels can be shown on the map clicking on the prices icons.